1. Papers concerning the sending of 300,000 weight of tin to Holland. The first paper is as to the urgency of buying the tin without loss of time, as there were but four markets in the year, viz., at the four quarterly coinages. If sent to Holland, it would be expedient to have a convoy; but if put on board a man-of-war, the freight of about 250l. would be saved. Dated 2 July 1690. (2.) Extract from Lord Dursley's letter, stating that English tin was never so low as then, &c. Dated Hague, June 20/30 1690. (3.) Estimate of the profit which may arise to the King, in sending 300,000 weight of tin into Holland as the price is now represented there; viz., 39 guilders per cwt. 4 pages. 2. Memorial of the Comrs of Excise, to the Lords of the Treasury, in vindication of their reputations; showing that by their Commission they were to advance money for the public service, and they had so advanced 100,000l. and other considerable sums for the use of the public; and were to receive the same out of rates and duties for satisfying 600,000l. to the States General of the United Provinces. They were conscious that they had improved the revenues, but they had been “scandalized, reproached, and traduced” as to their management by several persons who were Comrs of that revenue in the time of King James, and reports had been made that, by reason of their mismanagement and ignorance in matters of excise, the revenue was greatly fallen, and likely to come to little; and these reports had reached their Lordships, and their Majesties' ears; though they could with boldness affirm, that when they inspected their management in King James' time they found them in great disorder; they were further acquainted that Francis Parry, Esq., (who was one of the late Comrs that had so reflected upon them,) was to be appointed an Adjunct Comr with them, without being obliged to advance any moneys, &c.; praying that the charges against them might be brought to a public hearing; further, that this memorial was not out of disrespect to Mr. Parry, but for vindication of their reputations, which were already impaired and become public talk and obloquy, by reason of the intended Adjunct Comr. Dated 3 July 1690. Minuted:—“The Lds are satisfy'd the complaints are groundless, & they shall be heard if any thing of that kynd be offer'd against them.” 1 large page and a quarter. 3. Report of the Comrs of Customs to the Lords of the Treasury, on the petition of John Fentzall of London, merchant, that they do not object to the entry of a “nolle prosequi” upon an information for importing certain steel wire from Holland. Dated 3 July 1690. Accompanied by the petition. 2 pages. 4. Presentment of the Comrs of Customs to the Lords of the Treasury, moving that a privy seal might pass to discharge the accounts of Sir William Poole, late collector of the port of Bristol, of 4,247l. 7s. 2d. being the surcharges made upon him for abatement of the new impositions on tobacco and sugar; by order of His Majesty's agents, when Prince of Orange. Dated 5 July 1690. 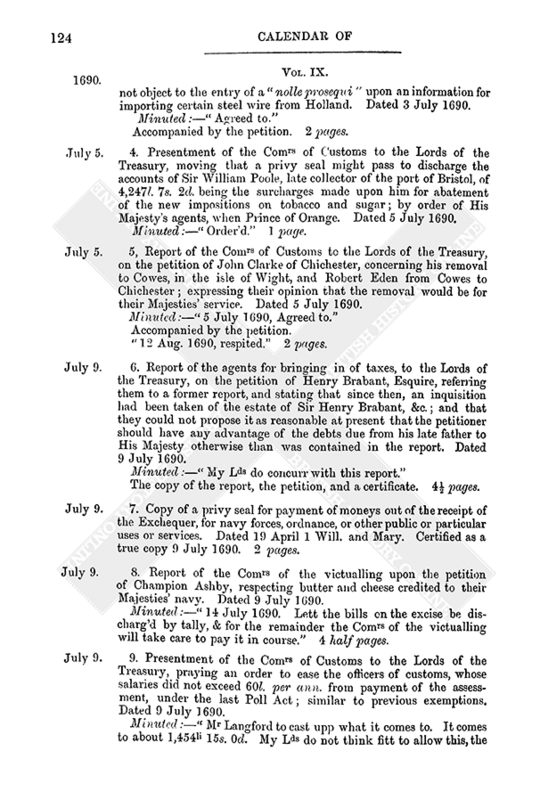 5, Report of the Comrs of Customs to the Lords of the Treasury, on the petition of John Clarke of Chichester, concerning his removal to Cowes, in the isle of Wight, and Robert Eden from Cowes to Chichester; expressing their opinion that the removal would be for their Majesties' service. Dated 5 July 1690. “12 Aug. 1690, respited.” 2 pages. 6. Report of the agents for bringing in of taxes, to the Lords of the Treasury, on the petition of Henry Brabant, Esquire, referring them to a former report, and stating that since then, an inquisition had been taken of the estate of Sir Henry Brabant, &c.; and that they could not propose it as reasonable at present that the petitioner should have any advantage of the debts due from his late father to His Majesty otherwise than was contained in the report. Dated 9 July 1690. The copy of the report, the petition, and a certificate. 4½ pages. 7. Copy of a privy seal for payment of moneys out of the receipt of the Exchequer, for navy forces, ordnance, or other public or particular uses or services. Dated 19 April 1 Will. and Mary. Certified as a true copy 9 July 1690. 2 pages. 8. Report of the Comrs of the victualling upon the petition of Champion Ashby, respecting butter and cheese credited to their Majesties' navy. Dated 9 July 1690. Minuted:—“14 July 1690. Lett the bills on the excise be discharg'd by tally, & for the remainder the Comrs of the victualling will take care to pay it in course.” 4 half pages. 9. Presentment of the Comrs of Customs to the Lords of the Treasury, praying an order to ease the officers of customs, whose salaries did not exceed 60l. per ann. from payment of the assessment, under the last Poll Act; similar to previous exemptions. Dated 9 July 1690. Minuted:—“Mr Langford to cast upp what it comes to. It comes to about 1,454li 15s. 0d. My Lds do not think fitt to allow this, the tax being but small of 12d. per li., & every body ought to bear some share of the comon burthen.” 1 page. 10. Representation of the Comrs of Excise to the Lords of the Treasury, showing that the arrears of excise were greatly increased, and a great part likely to be wholly lost, by reason in some places there were no justices of the peace appointed by their Majesties; and in others, where they were appointed, they refused to act: giving the particulars of a number of persons who had been refused licences on various grounds. Dated 11 July 1690. Minuted:—“The Comrs of Excise to prepare letters to be signed by the Lds of the Treary, directed to the severall persons complain'd of in this memoriall.” 2½ pages. 11. 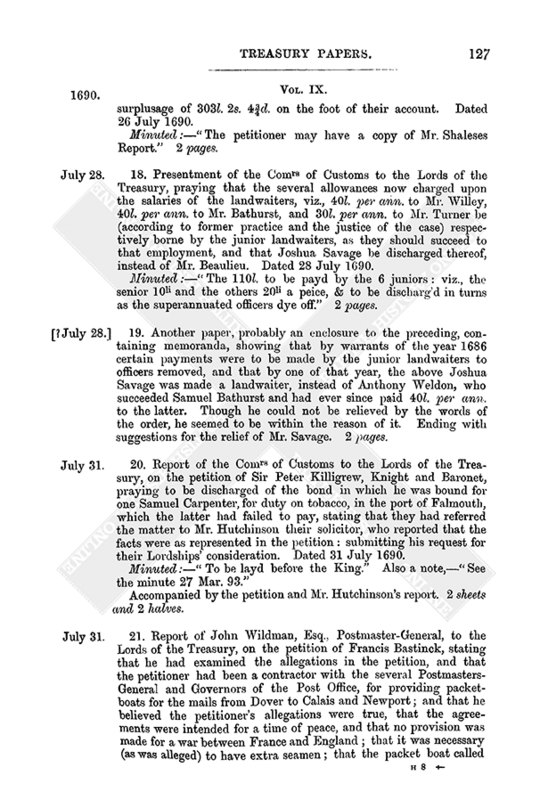 Report of the Comrs of Customs to the Lords of the Treasury, on the petition of Sir Chr. Letheulier and others, interested in the lading of the ship “St. Antonio;” praying a “nolle prosequi” for the King's part of the forfeiture; and an order to discharge the ship and lading, on giving the officers a suitable recompence, submitting that they had no objection to the granting of the nolle prosequi. Dated 12 July 1690. Also the petition. 2 pages. 12. Report of the agents for taxes to the Lords of the Treasury on the petition of Thomas Brabin, Esq., recommending that he should be allowed 100l. for his charges, disbursement, and pains in the discharge of his duties as solicitor within the county and city of Lincoln and county of Rutland, for the levying the aid of 12d. in the pound; and further recommending him to favour. Dated 14 July 1690. Two petitions and a certificate. 4 pages. 13. Report of Robert Humfreys, gent., Deputy Auditor of Wales, on the petition of John Hoblyn, Esqre, as to rent and arrears due to the Crown; arising from the lordship of Dyffrin Cloyd, in the town of Ruthin, of which lordship the petitioner was owner. Dated 18 July 1690. At the foot is another letter to their lordships stating that the petitioner had proposed himself and his next brother Mr. Edward Hoblyn as security for 900l., being the said arrears. Dated 7 Jan. 1690–1. “The Lds can allow ye petr but 2 years; ye first paymt to commence at Michas next, & so to continue half yearly (in proportion) till ye whole is pd.” 3 pages. 14. 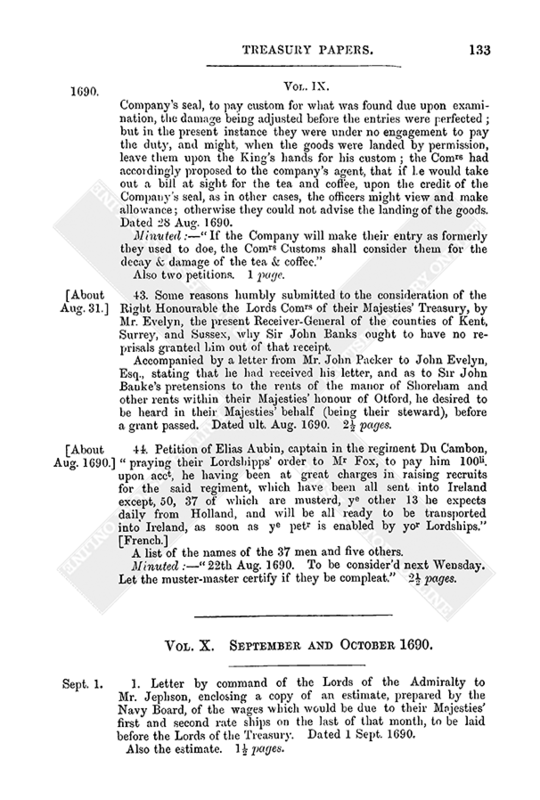 Report of the Comrs of Customs to the Lords of the Treasury, on the petition of William Carter, to be admitted into such station in the customs in the port of London as their Lordships should think fit; certifying their high approval of him, as a person of no mean experience, and that they in the previous July designed him to visit the western ports; and were giving him instructions and despatches for that purpose, when they received a warrant from their Lordships to dismiss him and to constitute Col. Willm. Parsons in his stead, expressing the opinion that he was well qualified as a land surveyor of that port. Dated 18 July 1690. 15. 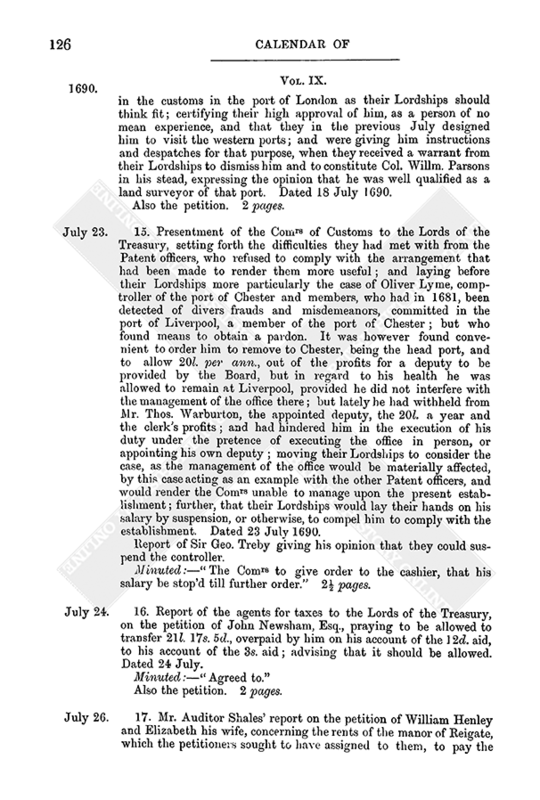 Presentment of the Comrs of Customs to the Lords of the Treasury, setting forth the difficulties they had met with from the Patent officers, who refused to comply with the arrangement that had been made to render them more useful; and laying before their Lordships more particularly the case of Oliver Lyme, comptroller of the port of Chester and members, who had in 1681, been detected of divers frauds and misdemeanors, committed in the port of Liverpool, a member of the port of Chester; but who found means to obtain a pardon. It was however found convenient to order him to remove to Chester, being the head port, and to allow 20l. per ann., out of the profits for a deputy to be provided by the Board, but in regard to his health he was allowed to remain at Liverpool, provided he did not interfere with the management of the office there; but lately he had withheld from Mr. Thos. Warburton, the appointed deputy, the 20l. a year and the clerk's profits; and had hindered him in the execution of his duty under the pretence of executing the office in person, or appointing his own deputy; moving their Lordships to consider the case, as the management of the office would be materially affected, by this case acting as an example with the other Patent officers, and would render the Comrs unable to manage upon the present establishment; further, that their Lordships would lay their hands on his salary by suspension, or otherwise, to compel him to comply with the establishment. Dated 23 July 1690. Report of Sir Geo. Treby giving his opinion that they could suspend the controller. Minuted:—“The Comrs to give order to the cashier, that his salary be stop'd till further order.” 2½ pages. 16. Report of the agents for taxes to the Lords of the Treasury, on the petition of John Newsham, Esq., praying to be allowed to transfer 21l. 17s. 5d., overpaid by him on his account of the 12d. aid, to his account of the 3s. aid; advising that it should be allowed. Dated 24 July. 17. Mr. 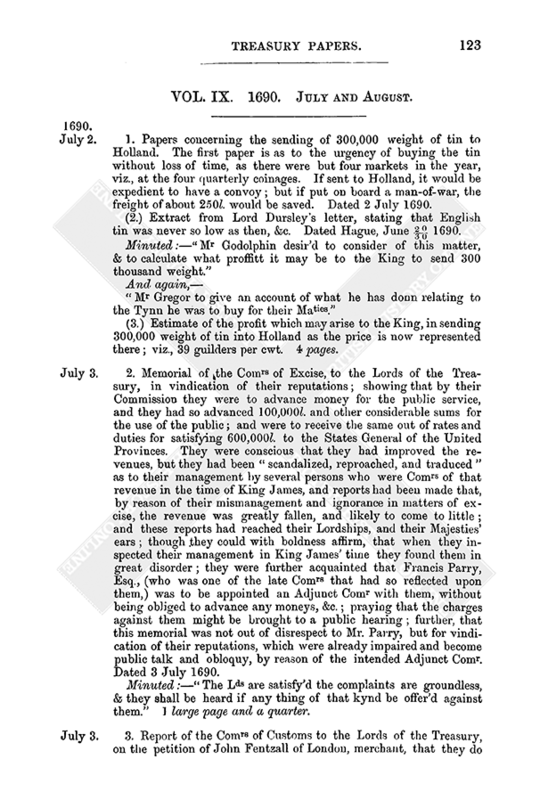 Auditor Shales' report on the petition of William Henley and Elizabeth his wife, concerning the rents of the manor of Reigate, which the petitioners sought to have assigned to them, to pay the surplusage of 303l. 2s. 4¾d. on the foot of their account. Dated 26 July 1690. Minuted:—“The petitioner may have a copy of Mr. Shaleses Report.” 2 pages. 18. Presentment of the Comrs of Customs to the Lords of the Treasury, praying that the several allowances now charged upon the salaries of the landwaiters, viz., 40l. per ann. to Mr. Willey, 40l. per ann. to Mr. Bathurst, and 30l. per ann. to Mr. Turner be (according to former practice and the justice of the case) respectively borne by the junior landwaiters, as they should succeed to that employment, and that Joshua Savage be discharged thereof, instead of Mr. Beaulieu. Dated 28 July 1690. Minuted:—“The 110l. to be payd by the 6 juniors: viz., the senior 10li and the others 20li a peice, & to be discharg'd in turns as the superannuated officers dye off.” 2 pages. 19. Another paper, probably an enclosure to the preceding, containing memoranda, showing that by warrants of the year 1686 certain payments were to be made by the junior landwaiters to officers removed, and that by one of that year, the above Joshua Savage was made a landwaiter, instead of Anthony Weldon, who succeeded Samuel Bathurst and had ever since paid 40l. per ann. to the latter. Though he could not be relieved by the words of the order, he seemed to be within the reason of it. Ending with suggestions for the relief of Mr. Savage. 2 pages. 20. Report of the Comrs of Customs to the Lords of the Treasury, on the petition of Sir Peter Killigrew, Knight and Baronet, praying to be discharged of the bond in which he was bound for one Samuel Carpenter, for duty on tobacco, in the port of Falmouth, which the latter had failed to pay, stating that they had referred the matter to Mr. Hutchinson their solicitor, who reported that the facts were as represented in the petition: submitting his request for their Lordships' consideration. Dated 31 July 1690. Accompanied by the petition and Mr. Hutchinson's report. 2 sheets and 2 halves. 21. 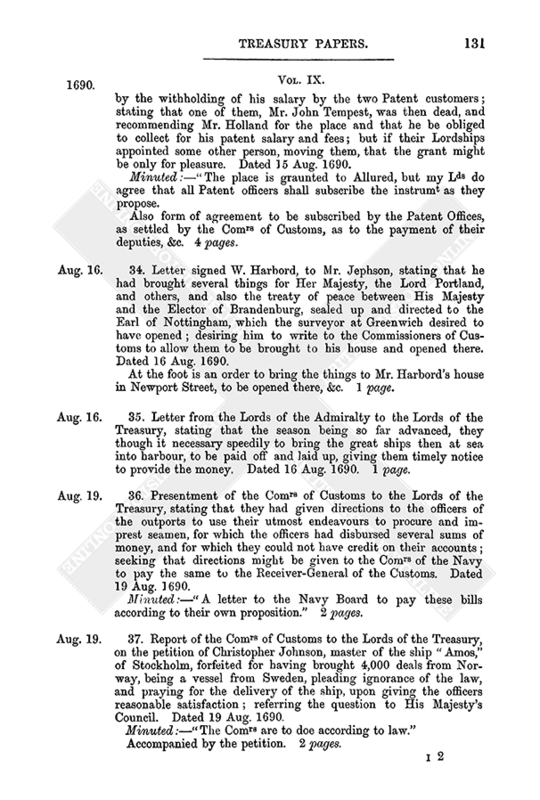 Report of John Wildman, Esq., Postmaster-General, to the Lords of the Treasury, on the petition of Francis Bastinck, stating that he had examined the allegations in the petition, and that the petitioner had been a contractor with the several Postmasters-General and Governors of the Post Office, for providing packetboats for the mails from Dover to Calais and Newport; and that he believed the petitioner's allegations were true, that the agreements were intended for a time of peace, and that no provision was made for a war between France and England; that it was necessary (as was alleged) to have extra seamen; that the packet boat called the “Philip,” coming from Newport with the mails, was taken by a French privateer, and carried to Dunkirk as a prize; that the seamen who were then taken prisoners received from the petitioner 125l. 14s. 6d. and 23l. 18s. 6d. ; that the 27l. 1s. 3d. demanded by the petitioner for colours for the packet boats was unnecessary, and that proof was offered of the sums due by affidavits annexed. Dated 31 July 1690. The petition, together with an account and six affidavits. 11 pages or parts of pages. 22. Report of the [Commissioners of Customs?] in favour of reinstating Mr. Upton, late tide surveyor of Falmouth, on account of his loyalty, affection, and services. Dated 4 Aug. 1690. Also certificates, &c. in his favour. Minuted:—“If the Comrs think fitt to present him to any employmt suitable for him, my Lds will then consider of it. Speak with the Comrs.” 4½ pages. 23. Report, signed J. Somers [Solicitor-General] made to [Her] Majesty, upon the petition of John Davison and others, inventors of certain instruments or engines for the draining and making land profitable, advising that if the Queen should grant the sole benefit of the invention for 14 years, it would be effectual in law, but as to the grant of the soil so recovered, setting forth various difficulties. Dated 4 June 1690. At the foot is a notice, that it was referred by Her Majesty's direction to the Lords of the Treasury on 16 June 1690. Another report, signed “William Tailer in the absence of Mr. Surveyor-General,” stating that as to the grant of the soil, he thinks it unadvisable, &c. Dated 4 Aug. 1690. Also answers by the petitioner to objections made by the Lords of the Treasury, indorsed thus,—“Memoriall of John Davison, &c., in answer to theyr Lo[r]pps minute, upon his petition for a grant of ousy land, &c., between high and low-water marke.” 4 pages. 24. Letter from the Lords of the Admiralty, to the Lords of the Treasury, pressing upon their Lordships' consideration the great importance it was to their Majesties' service that the seamen should have all fitting encouragement, and that money should be speedily supplied to the governors of the chest; and further, that the time when they would be paid should be notified in the Gazette. Dated 4 Aug. 1690. Memorial to the same effect, from the governors of the chest at Chatham. Dated 6 Aug. 1690. Two other papers relating thereto. 3 pages and 2 halves. 25. Report of the Earl of Ranelagh, on the petition of Mr. James Smithesby, agent to a regiment of foot, in favour of an allowance to him of 201l. 17s. 9d. Dated 5 Aug. 1690. Also the petition, together with the copy of a letter from William Jephson, Esq., to the Earl asking him to report on the petition. 3 pages. 26. 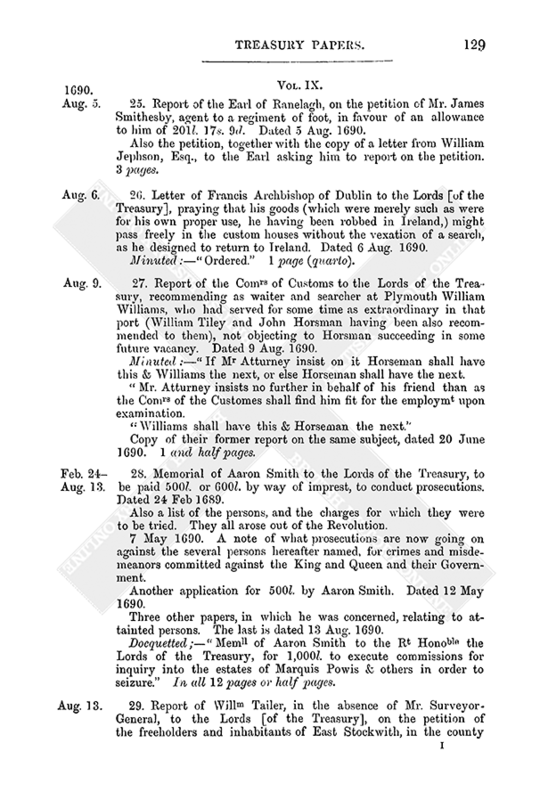 Letter of Francis Archbishop of Dublin to the Lords [of the Treasury], praying that his goods (which were merely such as were for his own proper use, he having been robbed in Ireland,) might pass freely in the custom houses without the vexation of a search, as he designed to return to Ireland. Dated 6 Aug. 1690. 27. 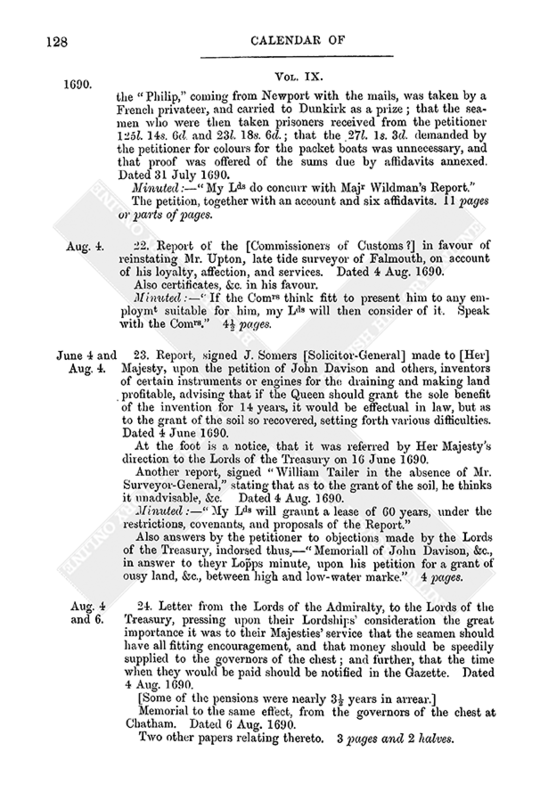 Report of the Comrs of Customs to the Lords of the Treasury, recommending as waiter and searcher at Plymouth William Williams, who had served for some time as extraordinary in that port (William Tiley and John Horsman having been also recommended to them), not objecting to Horsman succeeding in some future vacancy. Dated 9 Aug. 1690. Minuted:—“If Mr Atturney insist on it Horseman shall have this & Williams the next, or else Horseman shall have the next. “Mr. Atturney insists no further in behalf of his friend than as the Comrs of the Customes shall find him fit for the employmt upon examination. Copy of their former report on the same subject, dated 20 June 1690. 1 and half pages. 28. Memorial of Aaron Smith to the Lords of the Treasury, to be paid 500l. or 600l. by way of imprest, to conduct prosecutions. Dated 24 Feb 1689. Also a list of the persons, and the charges for which they were to be tried. They all arose out of the Revolution. 7 May 1690. A note of what prosecutions are now going on against the several persons hereafter named, for crimes and misdemeanors committed against the King and Queen and their Government. Another application for 500l. by Aaron Smith. Dated 12 May 1690. Three other papers, in which he was concerned, relating to attainted persons. The last is dated 13 Aug. 1690. Docquetted;—“Memll of Aaron Smith to the Rt Honoble the Lords of the Treasury, for 1,000l. to execute commissions for inquiry into the estates of Marquis Powis & others in order to seizure.” In all 12 pages or half pages. 29. Report of Willm Tailer, in the absence of Mr. Surveyor-General, to the Lords [of the Treasury], on the petition of the freeholders and inhabitants of East Stockwith, in the county of Lincoln, who had two years before pētitioned for a lease of the passage over the Trent, in the town of Stockwith, and for six acres of meadow there, to be granted them for such a number of years in reversion as might fill up the term of a lease to William Midwinter, gent., to thirty-one years; stating that the passage and land, being part of the duchy of Cornwall, were granted by King Charles the First (when Prince) in trust to the use of the inhabitants for 21 years, and subsequently they were again granted. If their Lordships should grant a new lease to trustees for the inhabitants in respect of their ancient tenancy, and the wrong which seemed to have been done to them by Mr. Midwinter, he thought a fine of 45l. reasonable for a term of 28 years in reversion, &c. Dated 13 Aug. 1690. Copy of the petition and an affidavit referred to in the report. Also a further petition on the same subject, and “The case between Wm Midwinter, gen., and the inhabitants of East Stockwith.” 6½ pages. 30. 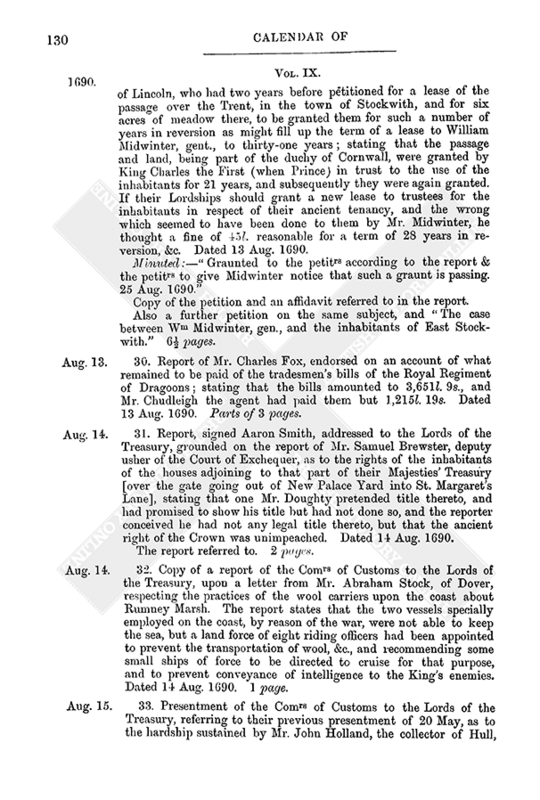 Report of Mr. Charles Fox, endorsed on an account of what remained to be paid of the tradesmen's bills of the Royal Regiment of Dragoons; stating that the bills amounted to 3,651l. 9s., and Mr. Chudleigh the agent had paid them but 1,215l. 19s. Dated 13 Aug. 1690. Parts of 3 pages. 31. Report, signed Aaron Smith, addressed to the Lords of the Treasury, grounded on the report of Mr. Samuel Brewster, deputy usher of the Court of Exchequer, as to the rights of the inhabitants of the houses adjoining to that part of their Majesties' Treasury [over the gate going out of New Palace Yard into St. Margaret's Lane], stating that one Mr. Doughty pretended title thereto, and had promised to show his title but had not done so, and the reporter conceived he had not any legal title thereto, but that the ancient right of the Crown was unimpeached. Dated 14 Aug. 1690. The report referred to. 2 pages. 32. Copy of a report of the Comrs of Customs to the Lords of the Treasury, upon a letter from Mr. Abraham Stock, of Dover, respecting the practices of the wool carriers upon the coast about Rumney Marsh. The report states that the two vessels specially employed on the coast, by reason of the war, were not able to keep the sea, but a land force of eight riding officers had been appointed to prevent the transportation of wool, &c., and recommending some small ships of force to be directed to cruise for that purpose, and to prevent conveyance of intelligence to the King's enemies. Dated 14 Aug. 1690. 1 page. 33. Presentment of the Comrs of Customs to the Lords of the Treasury, referring to their previous presentment of 20 May, as to the hardship sustained by Mr. John Holland, the collector of Hull, by the withholding of his salary by the two Patent customers; stating that one of them, Mr. John Tempest, was then dead, and recommending Mr. Holland for the place and that he be obliged to collect for his patent salary and fees; but if their Lordships appointed some other person, moving them, that the grant might be only for pleasure. Dated 15 Aug. 1690. Minuted:—“The place is graunted to Allured, but my Lds do agree that all Patent officers shall subscribe the instrumt as they propose. Also form of agreement to be subscribed by the Patent Offices, as settled by the Comrs of Customs, as to the payment of their deputies, &c. 4 pages. 34. Letter signed W. Harbord, to Mr. Jephson, stating that he had brought several things for Her Majesty, the Lord Portland, and others, and also the treaty of peace between His Majesty and the Elector of Brandenburg, sealed up and directed to the Earl of Nottingham, which the surveyor at Greenwich desired to have opened; desiring him to write to the Commissioners of Customs to allow them to be brought to his house and opened there. Dated 16 Aug. 1690. At the foot is an order to bring the things to Mr. Harbord's house in Newport Street, to be opened there, &c. 1 page. 35. Letter from the Lords of the Admiralty to the Lords of the Treasury, stating that the season being so far advanced, they though it necessary speedily to bring the great ships then at sea into harbour, to be paid off and laid up, giving them timely notice to provide the money. Dated 16 Aug. 1690. 1 page. 36. Presentment of the Comrs of Customs to the Lords of the Treasury, stating that they had given directions to the officers of the outports to use their utmost endeavours to procure and imprest seamen, for which the officers had disbursed several sums of money, and for which they could not have credit on their accounts; seeking that directions might be given to the Comrs of the Navy to pay the same to the Receiver-General of the Customs. Dated 19 Aug. 1690. Minuted:—“A letter to the Navy Board to pay these bills according to their own proposition.” 2 pages. 37. 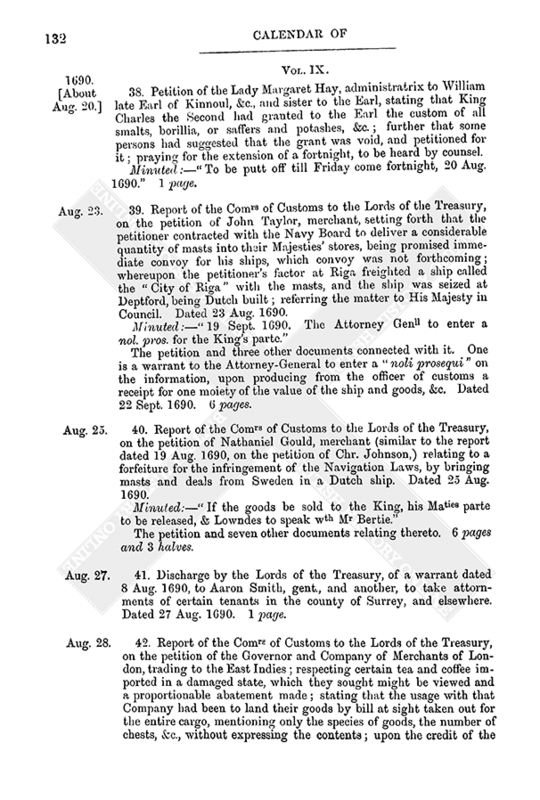 Report of the Comrs of Customs to the Lords of the Treasury, on the petition of Christopher Johnson, master of the ship “Amos,” of Stockholm, forfeited for having brought 4,000 deals from Norway, being a vessel from Sweden, pleading ignorance of the law, and praying for the delivery of the ship, upon giving the officers reasonable satisfaction; referring the question to His Majesty's Council. Dated 19 Aug. 1690. 38. Petition of the Lady Margaret Hay, administratrix to William late Earl of Kinnoul, &c., and sister to the Earl, stating that King Charles the Second had granted to the Earl the custom of all smalts, borillia, or saffers and potashes, &c.; further that some persons had suggested that the grant was void, and petitioned for it; praying for the extension of a fortnight, to be heard by counsel. Minuted:—“To be putt off till Friday come fortnight, 20 Aug. 1690.” 1 page. 39. 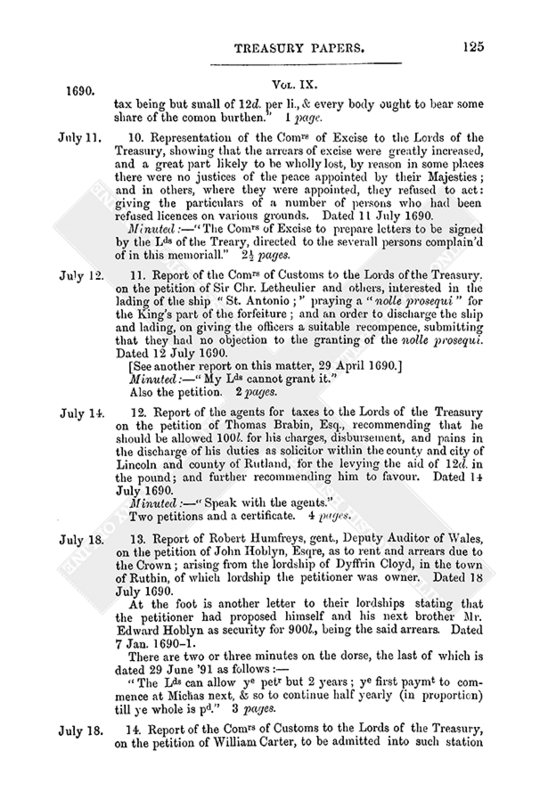 Report of the Comrs of Customs to the Lords of the Treasury, on the petition of John Taylor, merchant, setting forth that the petitioner contracted with the Navy Board to deliver a considerable quantity of masts into their Majesties' stores, being promised immediate convoy for his ships, which convoy was not forthcoming; whereupon the petitioner's factor at Riga freighted a ship called the “City of Riga” with the masts, and the ship was seized at Deptford, being Dutch built; referring the matter to His Majesty in Council. Dated 23 Aug. 1690. The petition and three other documents connected with it. One is a warrant to the Attorney-General to enter a “noli prosequi” on the information, upon producing from the officer of customs a receipt for one moiety of the value of the ship and goods, &c. Dated 22 Sept. 1690. 6 pages. 40. Report of the Comrs of Customs to the Lords of the Treasury, on the petition of Nathaniel Gould, merchant (similar to the report dated 19 Aug. 1690, on the petition of Chr. Johnson,) relating to a forfeiture for the infringement of the Navigation Laws, by bringing masts and deals from Sweden in a Dutch ship. Dated 25 Aug. 1690. The petition and seven other documents relating thereto. 6 pages and 3 halves. 41. Discharge by the Lords of the Treasury, of a warrant dated 8 Aug. 1690, to Aaron Smith, gent., and another, to take attornments of certain tenants in the county of Surrey, and elsewhere. Dated 27 Aug. 1690. 1 page. 42. Report of the Comrs of Customs to the Lords of the Treasury, on the petition of the Governor and Company of Merchants of London, trading to the East Indies; respecting certain tea and coffee imported in a damaged state, which they sought might be viewed and a proportionable abatement made; stating that the usage with that Company had been to land their goods by bill at sight taken out for the entire cargo, mentioning only the species of goods, the number of chests, &c., without expressing the contents; upon the credit of the Company's seal, to pay custom for what was found due upon examination, the damage being adjusted before the entries were perfected; but in the present instance they were under no engagement to pay the duty, and might, when the goods were landed by permission, leave them upon the King's hands for his custom; the Comrs had accordingly proposed to the company's agent, that if he would take out a bill at sight for the tea and coffee, upon the credit of the Company's seal, as in other cases, the officers might view and make allowance; otherwise they could not advise the landing of the goods. Dated 28 Aug. 1690. Also two petitions. 1 page. 43. Some reasons humbly submitted to the consideration of the Right Honourable the Lords Comrs of their Majesties' Treasury, by Mr. Evelyn, the present Receiver-General of the counties of Kent, Surrey, and Sussex, why Sir John Banks ought to have no reprisals granted him out of that receipt. Accompanied by a letter from Mr. John Packer to John Evelyn, Esq., stating that he had received his letter, and as to Sir John Banke's pretensions to the rents of the manor of Shoreham and other rents within their Majesties' honour of Otford, he desired to be heard in their Majesties' behalf (being their steward), before a grant passed. Dated ult. Aug. 1690. 2½ pages. A list of the names of the 37 men and five others. Minuted:—“22th Aug. 1690. To be consider'd next Wensday. Let the muster-master certify if they be compleat.” 2½ pages.